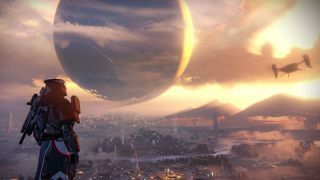 Destiny is launching on both current and next-gen console hardware, but Bungie has placed an inter-generational barrier between the two, preventing gamers of old and new from playing together. The reason for this, according to Bungie, is because of the perception that gamers on newer platforms will have an advantage over last-genners. "I'll speak for the hypothetical player," Wolfson told Digital Trends. "I have a disadvantage sniping across the map because [my opponent with a next-gen console] is only two pixels on my screen and I'm four pixels on his. "You see that in the world of PC gaming, where people are always racing to the best video card to give themselves the advantage"
"Regardless of where the reality is, there's definitely a perception among gamers that better hardware means you have an advantage. We don't want to have to enter that fray, so to create the best, most level playing field, both actually and perceptually, we separated it by platform." Destiny is available in beta on PS3 and PS4 right now, with Xbox 360 and Xbox One set to get access on June 24.